Is Halloween an Indian Festival? The era of adopting westernized techniques to ideology to dressing style and so on; the air of western culture is widely dominant in India, since more than a decade. As we are saying that our Indian culture is being modified by western views, here I contradict my own statement by highlighting the Indian traditional and cultural norms still being valued in the form of our enthusiastic and bright Indian festivals. Have you ever wondered that may be these Indian festivals have some connection with the Western world festivals; or rather few of the festivals hold the same significance and motive for celebrating them. If you say yes, then yea you are absolutely correct because here we have unusual similarities between the ‘horror festival of Halloween’ and ‘Indian festival of Kali Chaudas’. The Celtic tribe celebrated Samhain, at the beginning of winter season to please the evil ghostly powers, which are said to dominate over the Sun God on this day. The Druid circle performs their own ceremonies on this day along with offering thanks to the dead for the rich harvest of the season. So the entire kingdom is kindled with fire before the new moon day to welcome the wandering dead spirits and offer them with the grand feast to pacify their hungry souls. The Indian festival of Kali Chaudas falls on the fourteenth day of the moon cycle or one day before the new moon day, marked by the bright festival of Diwali. This festival is associated with the period to celebrate the harvest of this season and offer auspicious homage to their ‘Kul-devta or kul-devi’. Before this festival, Indians pay special reverence to their ancestors by organizing Shradh puja and honouring their Pitras or manes. During this shradh period, families prepare great feasts to pacify the hungry souls of their ancestors and receive blessings from them. The also feed the birds as they are considered to be the spirits of dead and messengers of Lord Yama (God of Death). The Halloween gives special importance to ‘Pumpkin’ and devilish faces are painted on it and placed outside the house, to prevent the entrance of evil spirits and wandering souls inside the house. In the same way, Pumpkin was also used by Indians to restrict the wanderers to a particular way and it was also used in magical ceremonies of keeping away the evil spirits. Both the western and Indian world gives opportunity to the kids to enjoy on this festival and celebrate it with zest. In west, children dress up as evil and devilish characters and go from one house to another to collect funds and similarly the Indian kids dress up in their best attire during the festive season of Deepawali. 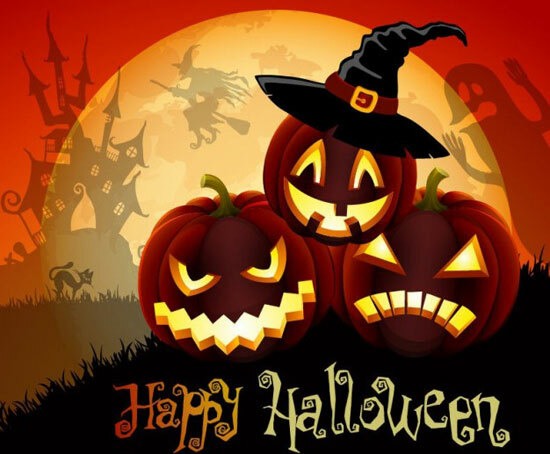 As the evil ‘witch’ is widely prominent in Halloween and people dress up like them to scare them away, and not let them enter their house or destroy their harvest. The story of Adam’s wife Lilith, turning into a succubus is widely known and since then the demon role of women was evident. In Indian context, the furious and devilish form of Goddess Kali is revered on this day for ending Naraksura (demon). This shows that how a beautiful, elegant lady can transform into devilish form when she has been exploited and failed to get the respect as women. So the two festivals are almost similar as the idea of feeding the ghosts or ancestors for pacifying their soul and celebrating the pious day of Diwali and All Saints Day and All Souls Day respectively; truly signify the connectivity among humanity and one world as a whole. This entry was posted in Mythology and tagged All Saints Day, ancestors, astrology, auspicious, blessings, book now, celebration, children, demon, devil, devotees, diwali, Druid circle, durga, energy, evil, faith, feast, Festival, food, fortune, future, ghosts, Goddess Durga, Goddess Kali', Halloween, happiness, Happy Halloween, have a little faith, health, Hindu, horror, humanity, Indian, Kali Chaudas, Lord Yama, manes, Naraksura, new moon day, offerings, Pitra dosh, pitras, Samhain, Shradh, succubus, traditional, western, witches, World. The ultimate way to offer thanks to the ultimate source of energy ‘Surya Devta’ is a unique festival in this incredible India. Chhath is no more a regional festival of Biharis and Terai region Hindus, but is widely accepted by hilly origins and almost throughout India. Let us explore this Hindu thanks giving ceremony to God Sun. The auspicious tradition of Chhath puja was initiated by son of Surya, Karan who ruled over the Anga Desh (Munger district of Bihar) during the time of Mahabharata. Lord Rama and Mata Sita offered special prayers to lord Sun ad fasted after returning to Ayodhya from exile and begin the ritual of celebrating Chhath puja. The special powers were bestowed to Draupadi by Surya devta, which helped the Pandavas to regain back their kingdom of Hastinapur. 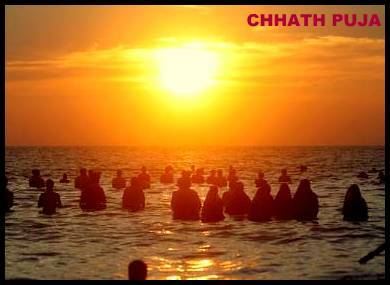 To receive immense blessings and prosperity from Surya, Chhath is celebrated lively for four days period during the Hindu month of Kartik. First day is Nahai Khai i.e. ‘Nahai’ means ‘bathing’ and ‘Khai’ means ‘to eat’; the devotees take a holy dip in river or lake and holy water is taken at home to cook prasadam (offering food). The second day is Kharna, on which the worshippers perform ‘nirjalahaar’ vrat for about 8 to 12 hours. By the end of the day, the fast is eneded by adoring lord Sun and eating Prasad. Then another 36 hours fast is begins. The third day is the main festival of Chhath called Sandhya Argha. The devotees clad themselves in yellow coloured attire and offer the specially prepared food offerings to Surya Devta at the riverbank in the evening. The last day is Suryodaya Argha on which the devotees gives the early morning offerings at the riverbank and break their fast by having Chhath Prasad. This festival is a morning and evening affair on all the four days as the sunrise and sunset rays are most beneficial for human body and consists of low intensity of ultra violet rays. The traditional festival of Chhath showers you with positivity by detoxifying the mind, soul and body; and removes the negative energies by adoring the powerful Sun. This entry was posted in Puja and tagged ancestors, Anga Desh, auspicious, awesome, benefits, bihar, blessings, body, book now, celebration, Chhath, Chhath puja, detoxify, devotees, diwali, Draupadi, early morning, energy, faith, Fast, Festival, for days, grace, have a little faith, healthy, Hindu, Hindu month, hinduism, karan, Kartik, Kharna, Lord Rama, mahabharata, mind, Nahai Khai, nirjalahaar, october 29th, offerings, Pandavas, powerful, prasad, prasadam, rays, rituals, riverbank, Sandhya Argha, showers, shubhpuja, shubhpuja.com, sita, soul, sun, sunrise, sunset, Surya, surya Devta, suryodaya argha, terai region, thanks giving, traditional, vrat, worshippers. The universe and its magical existence have a full-fledged influence on our lives, whether you believe it or not. People often wear stones or pearls to get rid of their issues and attract the positivity towards them. One of the rarest existences, in this dominant gem world is ‘Gajamukta’ or ‘commonly known as ‘elephant pearls’. 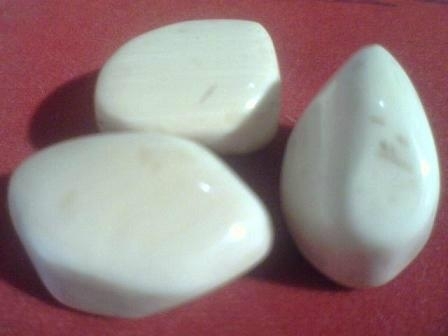 It is a yellowish-white, oversized egg shaped stones. It can also be brownish in tone, depending upon the formation. Gajamukta is the rarest pearl, known to exist in one out of the millions elephants. Its formation is exclusive, like its existence, i.e. from the calcified masses of ivory and tusk of the elephant. It is classified as a Mani that is rare in existence. Possessing magical and medicinal values, Gajamuktas are rare thus highly expensive and valuable and were owned by few of our great Kings of India during that era. The revered and valued stone of gajamukta has divine and magical existence. It is widely renowned as a stone that keeps you away from all the negativity and stress. The stone has a cool and peaceful radiation as the natural pearls have moon dominant qualities. It is a sure shot jackpot for the owners, who possess this stone as he never has to worry about finance; therefore it was owned by Maharajas in the earlier time. They have unique feature of curing acute diseases and can even bless the barren women with the ability to conceive. Major problems like arthritis and joint pains have been cured by this extra ordinary pearl. It not only has a scientific relevance but is also a divine healer as you feel a change in your inner self. The vibrations of your surroundings transform tremendously and your lost peace is regained by achieving silence. The ancient Buddhist texts consist of the magical relevance of elephant stone and is still revered and adored by them. “According to the scientific researches, an elephant lives for approximately 125 years, so these pearls takes more than 75 years to be formed. It begins from a tiny grain sized to different sized stone, according to the tusk of the elephant.” This rare gem is only found in Airavata race and has adjoining sentiments of gaining wealth, fame and curing diseases. The Hindu text believes that this pearl is a symbol of Lord Ganesh’s soul and therefore considered fortunate and lucky. Gajamukta is known to possess unique qualities that make it differentiate from others. When two elephant stones are placed together, they are attracted towards each other but they do not hold any magnetic traits. The water turns milky, if Gajmukta is put into clean water. Bubbles are produced, when the stone is kept in coconut water and the level of the water decreases, eventually. By placing the elephant stone on a betel leaf (Paan patta), it starts vibrating. This entry was posted in Products and tagged acute disease, Airavata race, auspicious, blessings, book now, bubbles, calcified, clean, conceive, cool, coverage, cure, divine, egg shaped, elephant pearls, expensive, extra ordinary, fame, gajamukta, gajmukta, Hindu, hinduism, Indian, ivory, joint pains, kings, lucky, magical, magnetic, mani, medicinal, natural, negativity, Paan patta, peaceful, pearl, radiation, rare, sentiments, silence, soul, stone, tusk, unique, unique testing, valuable, vibrations, wealth. The creative son of Brahma, lord Vishwakarma is the official creator of the magical residing palaces of Gods. He is the sole designer of the eternal Universe and maintains the unique connection between Earth and Heaven. The peculiar trait weapon and flying chariots of gods have also been innovatively designed by Lord Vishwakarma. The God of Manufacture is worshipped by the skilled class of devotees majorly being architects, engineers, craftsmen, potters, carpenter, goldsmiths, blacksmiths and other factory workers. Lord Vishwakarma is actually worshipped on the last day of the Bengali month i.e. Bhadra or Kanya Sakranti which falls on 17th September; but it is also celebrated on the fourth day of Diwali festival on Padyami. This festival has a major craze in Karnataka, West Bengal, Orissa, Bihar and Tripura, but widely celebrated by Indians globally. As the highest ranked creative God is being worshipped on this day and the entire industrial class revers him, this day is an official holiday for the industries. It is believed that the machines should take a peaceful rest on this particular day and let the glory of Vishwakrama fall upon them and make them more efficient. Factory owners also prefer buying new equipment or machinery on this day, as it is considered lucky and prosperous for their working. The day is not only auspicious for industries and machinery but also has further unique add on s. Govardhan Puja is also celebrated on this day to remember the miracles of Lord Krishna, when he saved the entire city of Gokul from the outrage of Lord Indra. 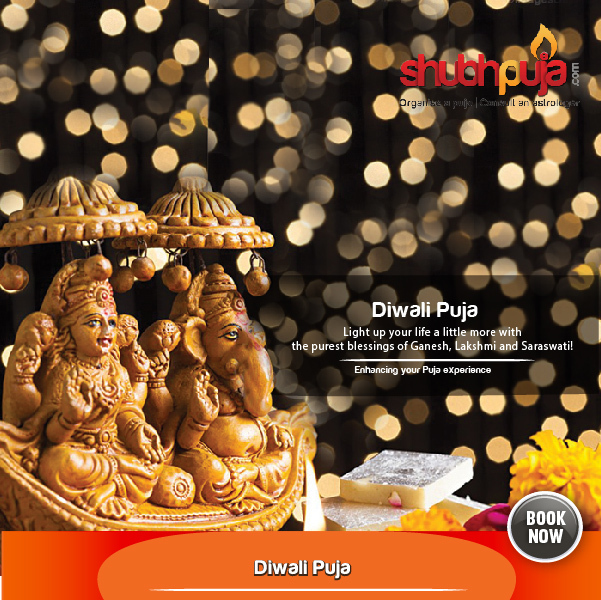 To increase the bond of love between couples, Gudi Padwa is celebrated in which the newly wed couples are invited for special treats by the bride’s family. This festival spreads the message of adoring creativity and boosting the talented God and his man power. It brings together people from the varied classes and leaves no distinction among them. When the entire working class comes together, it removes the pride of their ranks and they simply cherish their skills. Kite flying is also an important custom on this day, and Bihar and West Bengal arrange special kite flying festivals. The laurels of Vishwakarma’s innovation have been mentioned in mythology and Vedas. 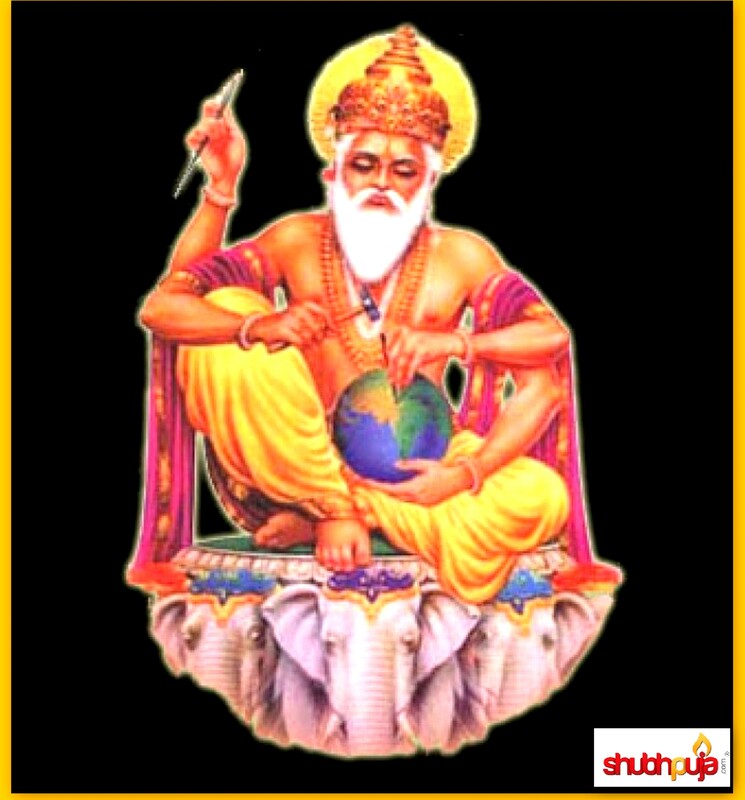 He has been credited for the flawless creation of God’s abodes in the four ‘yugas’. ‘Swarg lok’ or heaven has been created by the talented Lord Vishwakarma, which is the abode of Gods and is ruled by lord Indra. During the ‘Treta yug’, Vishwakarma built the beautiful golden city for Lord shiva and Parvati. This was later demanded by Ravana in return of ‘dakshina’; since then it was called as the ‘Raavan’s sone ki Lanka’. The city of Lord Krishna, Dwarka has been established by Vishwakarma in the ‘Dwapar yug’, which is now a renowned pilgrimage for Hindu devotees. Lord Vishwakarma’s magic is also evident during the ‘kali yuga’, when the pandavas were ordered to live on a piece of land named ‘Khaandavprastha’. He transformed this barren land into a magical city of Indraprastha, which was known for its architectural beauty. This entry was posted in Puja and tagged architects, auspicious, beauty, blessings, celebration, creation, designing, diwali, dwarka, Earth, equipment, factory, flying chariot, fourth day, God's abode, Gokul, Govardhan puja, grace, Gudi Padwa, have a little faith, Heaven, holiday, Indraprastha, innovation, kite flying, Lord Vishwakarma, machines, Manufacture, owners, Padyami, palaces, pooja, pride, prosperity, puja, puja package, relevance, Shubh, shubhpuja, shubhpuja.com, skills, sone ki lanka, talent, universe, workers, worship, yugas. The auspicious festival of light, Diwali means the ‘row of lighted lamps’ which symbolise the journey from darkness to light. The festival is a message to illuminate our inner true selves and cherish our illuminated soul in the eternal Universe (Brahman). Let us explore few of the interesting facts about this bright festival. The main festive day of Diwali in the five day celebration marks the beginning of Hindu New Year according to the Vikrama calendar. The craze for this festival is not only evident among Indians but also foreigners around the globe. Nepal, Sri Lanka, Myanmar, Mauritius, Guyana, Trinidad & Tobago, Suriname, Malaysia, Singapore and Fiji have an official day off on Diwali. The Lord of Death, Yama is revered on this day by lighting a diya, to welcome the dead spirits back to their family. In Southern India, especially Goa and Konkan, people burn the effigies of Narakasura on the next day of Diwali. Naraksura, the demon was killed by Lord Krishna and 16,000 women were rescued from his captivity. The 12 years of banishment of the Pandavas ended on this day and they appeared on the Kartik Amavasya. Great Hindu King Vikramaditya was coroneted on this day, hence Diwali became a historical event. Lord Mahavira attained nirvana on Diwali day at Pavapuri thus highly celebrated by Jain community. Maharshi Dayananda, the founder of Arya Samaj attained his nirvana on this day and Shardiya Nav-Shasyeshti is celebrated every year from then. Bandi Chhorh Divas is celebrated by Sikhs on this day as the foundation stone for Golden Temple was laid in 1577. In 1619, Sixth Guru Shri Guru Hargobind Sahib Ji was freed from imprisonment of Emperor Jahangir from Gwalior fort, on the same day of Diwali. On this day Lord Vishnu rescued Goddess Lakshmi (and married her) from the prison of Demon king Bali and therefore Goddess Lakshmi is worshipped on Diwali. The day is celebrated with Gambling as a way of ensuring good luck for the coming year and also to remember the games of dice between Lord Shiva and Parvati Ji. To welcome the Goddess of wealth, the entire house is purified and cleaned, and lighted with earthen lamps to brighten her way to our homes. This day marks the commencement of new Fiscal Year for Hindu Shop owners and Businessman so they usually begin their new records from then. Burning of crackers are the symbol of celebration after achieving enlightenment and the fumes released are beneficial for removing the insects and flies. ‘Shubh Deepavali’ is the ethnic and traditional greeting for Deepawali, meaning ‘Have an auspiscious Deepavali’. This entry was posted in Puja and tagged Arya Samaj, auspicious, awesome, bestow, blessings, bright, burning, businessmen, celebration, cherish, cleaned, crackers, Deepawali, diwali, diyas, earthen lamps, Festival, gambling, goddess Lakshmi, happiness, Hindu New year, holiday, kartik Amavasya, King Bali, Laxmi, lighted diyas, lights, Lord Ganesh, Lord Mahavira, Lord Vishnu, Narakasura, New Fiscal Year, nirvana, pooja, puja package, Shubh, Shubh Deepavali, shubhpuja, shubhpuja.com, sweets, universe, Yama diya. The day for mothers to shower the precious love upon their kids by fasting, for their happiness and prosperity is Ahoi Ashtami. A different version of Karva Chauth, this vrat is considered auspicious for mothers to keep her children healthy and happy. This festival symbolises the deep rooted love of Ma (mother) and her Mamta (motherhood), who not only nourishes an embryo in her womb but also feel connected as one soul to her child. When is Ahoi Astami celebrated? Ahoi Ashtami falls on the eighth day after full moon or Krishna Paksha in the Kartik month of Hindu calendar. It is generally observed four days after Karva Chauth or eight days before Deepawali. This festival is more prominent in northern part of India than others. According to our traditional rituals, it is said that once there was a lady who had seven sons. She went to the forest for getting soil for renovating her house. As she was digging the soil, suddenly the axe slipped from her hand and it hit a baby cub. The baby cub shouted with pain and died at the spot. The lady felt sorry and depressed but now there was nothing left, which she could transform. She went back home but the clouds of misery didn’t left her way and she lost her seven sons within a year. Later she confessed her pain and agony with few of her neighbours and they suggested her to perform the remorseful act. She prayed to Goddess Ashtami Bhagwati to get rid of her sins and null the effect of her deed. From then on, she was completely involved in praying to Ahoi Mata and kept fast on the Krishna paksha Ashtami. Goddess was pleased by her faithful devotion and forgave her for killing the cub. She even got her seven sons back, by the grace of Goddess. Since then, this tale is an inspiration for mothers to fast and pray to Ahoi Mata for the well-being of their children. Ladies wake up early morning before sunrise, eat something and then begin their fast till evening. The nirjalahaar (without food and water) vrat ends when the moon appears at night or few of them end it by seeing stars in the sky. An idol of Ahoi Mata is placed or painted on the wall. A bowl of water is kept on it and the red colour thread is twisted around the bow l, smeared with turmeric. Story of Ahoi Mata is recited by the elderly lady of the house and everybody listens to her. 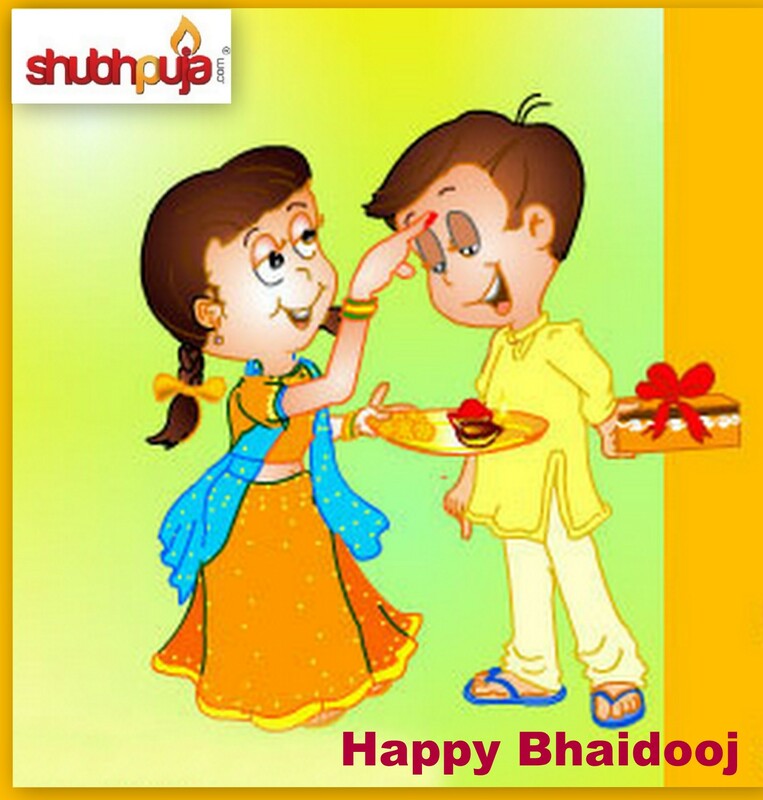 Special food items are prepared on this day like puris, halwa, boiled channa and jowar, etc depending upon the tradition. Sweets are offered to Goddess Ahoi and further distributed among the other family members. A garland of silver coins is also offered to Ahoi Mata and the coin keeps on increasing as further generations are added to the family. This festival is an epitome of love and care of motherhood. It’s a celebration of cherishing the eternal bond between kids and mothers. This fast is just an occasion but actually it is a scientific process of personal development through which the selfless love is nurtured within beings and spreads the message of humanity among the world. This entry was posted in Puja and tagged Ahoi, Ahoi Ashtami, Ahoi mata, ashtami Bhagwati, auspicious, axe, blessings, book now, bowl, care, child, children, connection, cub, Deepawali, diwali, eighth day, energy, faith, Festival, food, garland, happiness, have a little faith, Hindu, hinduism, Kartik, karva chauth, kids, Krishna paksha, love, message, motherhood, mothers, nirjalahaar, North India, personal development, pooja, prosperity, puja, relevance, Scientific, selfless, seven sons, shubhpuja, shubhpuja.com, silver coins, soul, special, sunrise, symbol, turmeric, well being, worship.